Left to right: Raffi Barsoumian, Robin Goodrin Nordli, Al Espinosa, Kyle Hines, Erin O'Connor. 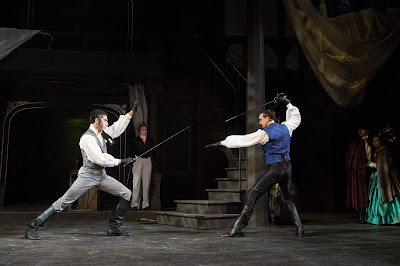 Photo courtesy Oregon Shakespeare Festival. When crafting their 2015 season, the Oregon Shakespeare Festival made one of their most interesting choices in recent history: They decided to run Eugene O’Neill’s Long Day’s Journey Into Night alongside the melodramatic 19th-century adaptation of The Count of Monte Cristo, the play that made – and ruined – his father. Alexandre Dumas’ classic tale of injustice and revenge is given a crowd-pleasing twist, through both the preserved script and director Marcela Lorca’s appealing interpretation. The play preserves some of the melodramatic devices that have fallen by the wayside– notably, soliloquies denoted by a wood block sound effect and a spotlight. Besides being funny, these dramatic speeches give us a more concrete view into the characters’ internal processes, something that modern plays have eschewed in favor of ambiguity. In this way, even complicated plots with a variety of motivations on all sides can be expressed to the audience. Former Broadway actor Al Espinosa performs marvelously as romantic protagonist Edmond Dantés. A good Dantés is larger-than-life, full of emotion, and as likely to rescue someone from the pit of Hell as he is to kick them into it. Espinosa’s version expresses emotion both as strength and as weakness, a Dantés who recognizes the irrational nature of his actions, yet resolves to see them carried out. The triptych of antagonists will be familiar to someone who read the book; the standout villain in this performance is Michael Sharon as Fernand, the cousin of Dantés’ fiancé Mercedes. In both the books and the adaptation, Fernand is the fiery, impulsive member of the conspiracy, and Sharon entertains the audience with his gleeful sense of evil. The fight at the end of the show is something to behold. The Count of Monte Cristo is one of the most fun and exciting plays of OSF’s 2015 season. It deviates fairly significantly from the book, but if you go into it expecting an adventurous melodrama instead of a faithful version (which would take around five hours anyway), you’re almost certainly going to have a good time. It’s especially a great play for families, so take your kids!